The Antarctic ice shelf is among the most hostile, uninhabitable environments on the face of the Earth. However, with virtually zero atmospheric pollution and low levels of electromagnetic interference, it is also one of the best places on the planet for climate, atmospheric, and geological research. But how do you keep a team of scientists from becoming meat popsicles in a place where temperatures rarely top 0 degrees? With a ski-wearing modular laboratory, of course. The Halley research expedition was founded in 1956 by the Royal Society. 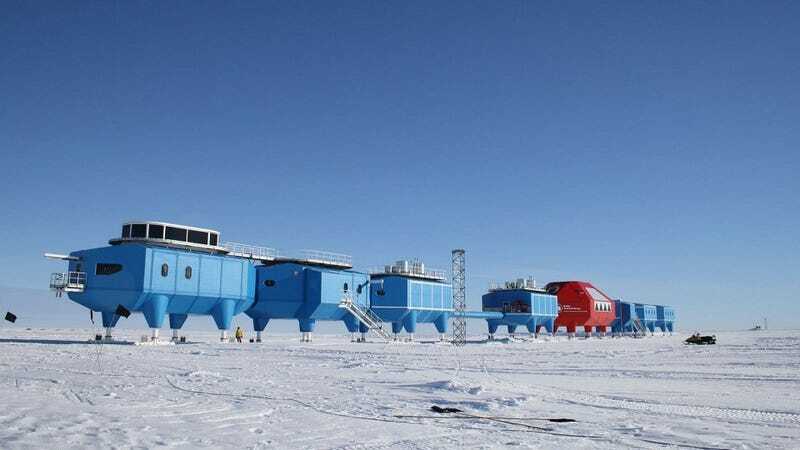 Named for Halley Bay, where the project initally landed, the Halley research station is situated on the Brunt Ice Shelf, a hundred-meter-thick area of ice in northwest Antarctica against the Weddell Sea. This is the sixth such research station the Royal Society has built (hence the "VI") over the years. The initial designs were little more than wooden huts connected with steel tunnels. These were promptly buried by snow and crushed by moving ice flows—a fate shared by the first four stations. Halley V, however, adopted a radical approach to staying above the snowline: hydraulic stilts that would keep the station beyond the encroaching snow, not unlike the Jetsons' house. The Halley VI goes even further by attaching skis to the bottoms of its hydraulic ram stilts, which allows it to be relocated occasionally via bulldozer. See, the Brunt Ice Shelf is actually floating away from the rest of Antarctica at a rate of about a half kilometer a year. As it pushes further into the Weddell Sea, it's exposed to higher temperatures and the forces of the tides, which will effectively rip it into icebergs. You don't want to be on the edge of an ice shelf as this is happening, hence the skis. Designed by Hugh Broughton Architects and built in Cape Town, South Africa, Halley VI comprises eight brightly colored modules made of glass-reinforced plastic (GRP) connected by flexible corridors. In addition to making the researchers' lives as comfortable as possible in these conditions, the station is designed to be as environmentally friendly as possible. It utilizes bio-reactors (anaerobic digesters) to treat sewage, vacuum toilets and water-saving taps to minimize water consumption, a two-stage incinerator to burn other waste, and solar, as well as solar-thermal, cells to supplement the diesel generators during the summer month.